Here are a few hints when choosing the tent just right for you or your family. Tents that are advertised as one person are rarely big enough for one person. Two person tents are usually comfortable for just one person, a three person tent is comfortable for two people and so forth. If you do not pick something large enough, you’ll find yourself cramped, claustrophobic and uncomfortable. Pick something that will give you a little room to maneuver and some space for a number of your gear also. Each individual needs about 3 by 7 feet to stretch out. You will need additional space to dress etc.. Remember, if the weather is not good, you’ll be stuck in whatever you have picked. .
You don’t want to be sitting cramped and hunched over feeling miserable. In deciding what you need, choose whether you’ll be summer or winter camping, and whether you will be backpacking. Tents aren’t waterproof. They are made from breathable ripstop nylon. It allows your sweat and breath to evaporate. This means you will need a rainfly. They are waterproof. It fits over the roof of the tent and is meant to carry rainwater away out of the tent sides. Make certain the fly is large enough to cover the tent walls. Applying a sealant to the tent seams is a good idea. Apply sealer as needed throughout the tents life. Most tents have a fine mesh screen over the door and window designed to keep insects out. All netting is not alike. Standard netting is made from nylon. Dacron is a finer mesh to discourage even the smallest bugs. They are usually zippered at the entrance with a flap which zippers over the doorway and door for privacy. Due to the nature of the fabric used in making tents, being porous, very few tents are designed to keep you warm. They are designed to protect you from the weather and from insects. They’ll protect you from the wind and rain, snow and sunlight. To look after your tent, nylon is virtually maintenance free. The one thing which should be done is sealant occasionally. 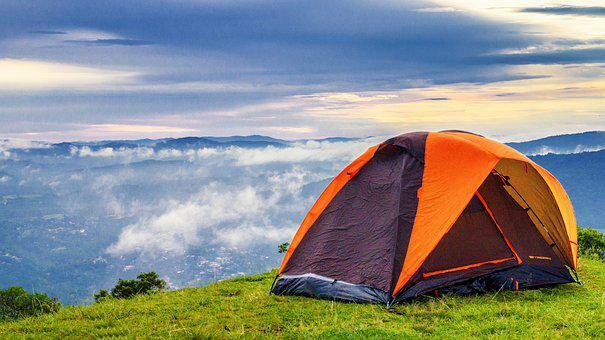 Of coarse never store your tent when it is wet, or even slightly moist. Always set it up when you’re finished your trip and dry it out completely. Additionally sponge off any dirt or mud inside using a very mild liquid detergent or a baking soda and water solution. Make certain to make any repairs if you’ve had the misfortune to burn or damage your tent in some way. You can purchase repair kits that are available in various colors and are simple to use. The basic style of the dome tent is hexagonal. The tent is generally free-standing or self supporting. This means no stakes or lines are necessary under normal conditions. However you shouldn’t leave it unoccupied without staking it down because the wind can send this lightweight tent tumbling off. The dome tent is great for backpackers and canoeists. Its the choice of winter campers and mountaineers in bigger sizes. The reason is due to its aerodynamic shape. The only problem with this kind of tent is it is not well ventilated. Moisture tends to gather at the top of the dome. This type of tent is primarily a backpacker’s shelter. The sort of material used is generally nylon. It is not very spacious. The advantage of this tent is how compact it’s. It could be rolled into a tight package no larger than a football. It is a free standing tent, not needing any lines or stakes unless a fly is added. It is lightweight, which makes it ideal for the backpacker or canoeist. Because of its design the wind flows off of it easily and makes it great for winter camping. It has a screened opening at one end and can be closed against severe weather. It’s easily erected and dismantled. Additionally, it ventilates well. The frame of the tent can be fitted to sleeves or standing independently of the shelter. Gone are the days of the vertical pole that used to hold it up in the center of the opening. They are generally made from nylon. Weights vary from about 3 pounds to about 6. These tents are ideal for canoe trips, climbers, fishermen and hunters. They are relatively lightweight and spacious. A vestibule can be added to the front opening adding very little weight and adding an extra 10 to 20 square feet. This makes it perfect for keeping your equipment and giving you extra sleeping area. Next Next post: Are skydivers crazy?